straight line. This is called a Line of Best Fit or Least-Squares Line. independent variable, x, is pinky finger length and the dependent variable, y, is height. For each set of data, plot the points on graph paper. Make your graph big enough and use a ruler. Then “by eye” draw a line that appears to “fit” the data. For your line, pick two convenient points and use them to find the slope of the line. Find the y-intercept of the line by extending your line so it crosses the y-axis. Using the slopes and the y-intercepts, write your equation of “best fit.” Do you think everyone will have the same equation? Why or why not? According to your equation, what is the predicted height for a pinky length of 2.5 inches? A random sample of 11 statistics students produced the following data, where x is the third exam score out of 80, and y is the final exam score out of 200. Can you predict the final exam score of a random student if you know the third exam score? Table showing the scores on the final exam based on scores from the third exam. 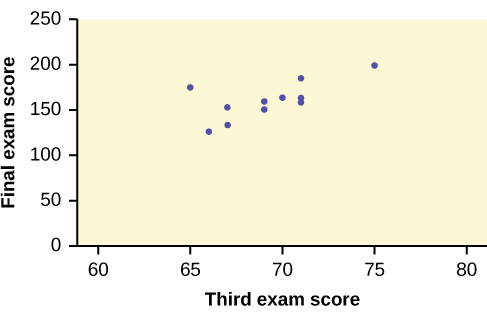 Scatter plot showing the scores on the final exam based on scores from the third exam. SCUBA divers have maximum dive times they cannot exceed when going to different depths. The data in [link] show different depths with the maximum dive times in minutes. Use your calculator to find the least squares regression line and predict the maximum dive time for 110 feet. At 110 feet, a diver could dive for only five minutes. The third exam score, x, is the independent variable and the final exam score, y, is the dependent variable. We will plot a regression line that best “fits” the data. If each of you were to fit a line “by eye,” you would draw different lines. We can use what is called a least-squares regression line to obtain the best fit line. Consider the following diagram. Each point of data is of the the form (x, y) and each point ofthe line of best fit using least-squares linear regression has the form (x, ŷ). The ŷ is read “y hat” and is the estimated value of y. It is the value of y obtained using the regression line. It is not generally equal to y from data. The term y0 – ŷ0 = ε0 is called the “error” or residual. It is not an error in the sense of a mistake. The absolute value of a residual measures the vertical distance between the actual value of y and the estimated value of y. In other words, it measures the vertical distance between the actual data point and the predicted point on the line. If the observed data point lies above the line, the residual is positive, and the line underestimates the actual data value for y. If the observed data point lies below the line, the residual is negative, and the line overestimates that actual data value for y. In the diagram in [link], y0 – ŷ0 = ε0 is the residual for the point shown. Here the point lies above the line and the residual is positive. For each data point, you can calculate the residuals or errors, yi – ŷi = εi for i = 1, 2, 3, …, 11. The sample means of the x values and the y values are and , respectively. The best fit line always passes through the point . coefficient, which is discussed in the next section. The process of fitting the best-fit line is called linear regression. The idea behind finding the best-fit line is based on the assumption that the data are scattered about a straight line. The criteria for the best fit line is that the sum of the squared errors (SSE) is minimized, that is, made as small as possible. Any other line you might choose would have a higher SSE than the best fit line. This best fit line is called the least-squares regression line . Computer spreadsheets, statistical software, and many calculators can quickly calculate the best-fit line and create the graphs. The calculations tend to be tedious if done by hand. Instructions to use the TI-83, TI-83+, and TI-84+ calculators to find the best-fit line and create a scatterplot are shown at the end of this section. Remember, it is always important to plot a scatter diagram first. If the scatter plot indicates that there is a linear relationship between the variables, then it is reasonable to use a best fit line to make predictions for y given x within the domain of x-values in the sample data, but not necessarily for x-values outside that domain. You could use the line to predict the final exam score for a student who earned a grade of 73 on the third exam. You should NOT use the line to predict the final exam score for a student who earned a grade of 50 on the third exam, because 50 is not within the domain of the x-values in the sample data, which are between 65 and 75. THIRD EXAM vs FINAL EXAM EXAMPLESlope: The slope of the line is b = 4.83. 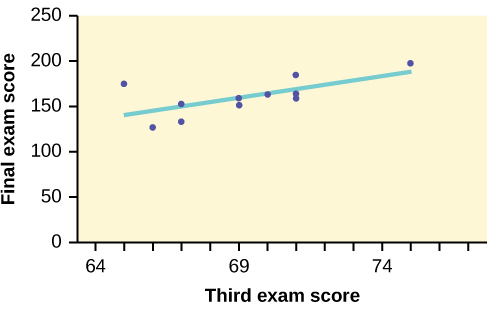 Interpretation: For a one-point increase in the score on the third exam, the final exam score increases by 4.83 points, on average. The output screen contains a lot of information. For now we will focus on a few items from the output, and will return later to the other items. The two items at the bottom are r2 = 0.43969 and r = 0.663. For now, just note where to find these values; we will discuss them in the next two sections. For Mark: it does not matter which symbol you highlight. To graph the best-fit line, press the “Y=” key and type the equation –173.5 + 4.83X into equation Y1. (The X key is immediately left of the STAT key). Press ZOOM 9 again to graph it. At RegEq: press VARS and arrow over to Y-VARS. Press 1 for 1:Function. Press 1 for 1:Y1. Then arrow down to Calculate and do the calculation for the line of best fit. Press Y = (you will see the regression equation). Besides looking at the scatter plot and seeing that a line seems reasonable, how can you tell if the line is a good predictor? Use the correlation coefficient as another indicator (besides the scatterplot) of the strength of the relationship between x and y. The correlation coefficient, r, developed by Karl Pearson in the early 1900s, is numerical and provides a measure of strength and direction of the linear association between the independent variable x and the dependent variable y.
where n = the number of data points. If you suspect a linear relationship between x and y, then r can measure how strong the linear relationship is. The value of r is always between –1 and +1: –1 ≤ r ≤ 1. If r = 0 there is absolutely no linear relationship between x and y (no linear correlation). If r = 1, there is perfect positive correlation. If r = –1, there is perfect negativecorrelation. In both these cases, all of the original data points lie on a straight line. Of course,in the real world, this will not generally happen. The formula for r looks formidable. 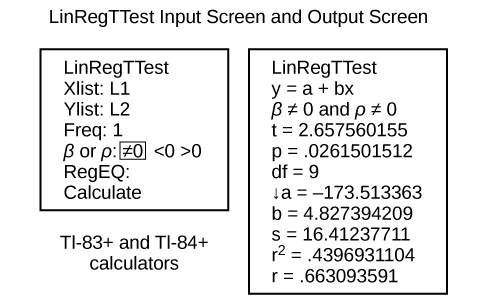 However, computer spreadsheets, statistical software, and many calculators can quickly calculate r. The correlation coefficient r is the bottom item in the output screens for the LinRegTTest on the TI-83, TI-83+, or TI-84+ calculator (see previous section for instructions). , when expressed as a percent, represents the percent of variation in the dependent (predicted) variable y that can be explained by variation in the independent (explanatory) variable x using the regression (best-fit) line. 1 – , when expressed as a percentage, represents the percent of variation in y that is NOT explained by variation in x using the regression line. This can be seen as the scattering of the observed data points about the regression line. Approximately 44% of the variation (0.4397 is approximately 0.44) in the final-exam grades can be explained by the variation in the grades on the third exam, using the best-fit regression line. A regression line, or a line of best fit, can be drawn on a scatter plot and used to predict outcomes for the x and y variables in a given data set or sample data. There are several ways to find a regression line, but usually the least-squares regression line is used because it creates a uniform line. Residuals, also called “errors,” measure the distance from the actual value of y and the estimated value of y. The Sum of Squared Errors, when set to its minimum, calculates the points on the line of best fit. Regression lines can be used to predict values within the given set of data, but should not be used to make predictions for values outside the set of data. The correlation coefficient r measures the strength of the linear association between x and y. The variable r has to be between –1 and +1. When r is positive, the x and y will tend to increase and decrease together. When r is negative, x will increase and y will decrease, or the opposite, x will decrease and y will increase. The coefficient of determination r2, is equal to the square of the correlation coefficient. When expressed as a percent, r2 represents the percent of variation in the dependent variable y that can be explained by variation in the independent variable x using the regression line. Use regression to find the equation for the line of best fit. Draw the line of best fit on the scatter plot. What is the slope of the line of best fit? What does it represent? The slope is 1.99 (b = 1.99). It means that for every endorsement deal a professional player gets, he gets an average of another 1.99 million in pay each year. What is the y-intercept of the line of best fit? What does it represent? What does an r value of zero mean? It means that there is no correlation between the data sets. When n = 2 and r = 1, are the data significant? Explain. When n = 100 and r = -0.89, is there a significant correlation? Explain. Yes, there are enough data points and the value of r is strong enough to show that there is a strong negative correlation between the data sets. What is the process through which we can calculate a line that goes through a scatter plot with a linear pattern? Explain what it means when a correlation has an r2 of 0.72. It means that 72% of the variation in the dependent variable (y) can be explained by the variation in the independent variable (x). Can a coefficient of determination be negative? Why or why not? where n is the number of data points. The coefficient cannot be more then 1 and less then –1. The closer the coefficient is to ±1, the stronger the evidence of a significant linear relationship between x and y. The Regression Equation by OpenStaxCollege is licensed under a Creative Commons Attribution 4.0 International License, except where otherwise noted.